President George W Bush has said a plot to bomb US-bound flights from the UK is a "stark reminder" that the US is still at war with Islamic extremists. Mr Bush said it showed "Islamic fascists... will use any means to destroy those of us who love freedom". He said the US was more secure now than before the attacks of 11 September 2001, but was not "completely safe". 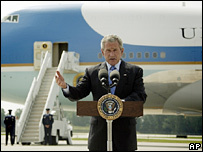 However Mr Bush's Democratic critics said the plot showed his policies had increased the threats faced by the US. US officials said the foiled plot involved detonating liquid explosives on board multiple commercial aircraft. The US government has for the first time raised the state of terror alert to red - its highest level - for flights from Britain. It has also increased the general level of security for all domestic and international flights. Extra sky marshals are being deployed on flights between the US and UK, and passengers have been banned from carrying any liquids and gels on to planes. Unnamed US officials said the airlines targeted were United, American and Continental, and involved flights to New York, Washington and California. Speaking in Green Bay, Wisconsin, Mr Bush said that despite increased security measures since 2001, it would be a "mistake to believe there was no threat to the US". "The American people need to know we live in a dangerous world, but our government will do everything we can to protect our people from those dangers," he added. Mr Bush had discussed the plot "in recent days" with UK Prime Minister Tony Blair, White House spokesman Tony Snow said. Senior Democrats - who have been criticising Mr Bush over the Iraq war - said the plot showed the terrorism threat had grown during his presidency. "It is clear that our misguided policies are making America more hated in the world and making the war on terrorism harder to win," Senator Edward Kennedy said. Senate Democratic leader Harry Reid said the Iraq war had "diverted our focus and more than $300bn in resources from the war on terrorism and has created a rallying cry for international terrorists". Michael Chertoff, US Director of Homeland Security, said the scheme was "suggestive of an al-Qaeda plot". "It was sophisticated, it had a lot of members and it was international in scope," he said. Mr Chertoff said air marshals would continue to operate "all over the world" but that extra resources would be deployed on the UK-US route.